Luke R. Barnesmoore is Founder and Executive Director of the Center for Critical Interdisciplinary Studies 501(c)3 (CCIS), Co-Founder/Director of the UBC Urban Studies Lab (UBC USL) and PhD Candidate in the University of British Columbia Department of Geography (Supervisors: Elvin K. Wyly; E. Wayne Ross; Simon Springer). Luke completed his B.A. in International Relations at San Francisco State University where he graduated first in his class and his M.A. in Human Geography at the University of British Columbia. Luke has held a number of academic positions including Visiting Scholar at the UC Berkeley Statnews.org Lab where he developed theories and methods for application of large data text corpora analysis software in social science and humanities research. His interdisciplinary research centers the nexus of worldview (cosmology, ontology, teleology), epistemology and human-nature relations through the lens of a nomadic set of topics including Urban Planning, Anarchist Planning, Utopian Planning, Indigenous Planning and, more generally, the role of Myth in formation of the ontological foundation that expands and constrains potentials for thought, feeling, behavior and conception of being. Luke’s research has a popular following on academia.edu where he has over 350 followers, over 45,000 total views and is often ranked in the top .1% of active researchers (https://ubc.academia.edu/Barnesmoore). Luke’s research has been published in a number of notable academic journals including The Annals of Applied Statistics (Institute of Mathematical Statistics), Environment and Planning A: Economy and Space (Sage) and City: analysis of urban trends, culture, theory, policy, action (Taylor & Francis). Luke has served in a range of editorial positions for a number of academic journals including City: analysis of urban trends, culture, theory, policy, action, Environment and Social Psychology, and ACME: An International Journal for Critical Geographies. Luke’s research has been funded by prestigious awards including the Patrick David Campbell Graduate Fellowship and the Walter G. Hardwick Scholarship in Urban Studies. Luke’s research has been influenced my a number of authors including: Michel Foucault, Four Arrows, Gregory Cajete, Vine Deloria Jr., Dawn Morrison, Lao Zi, Zhuang Zi, Thomas Cleary, Meng Zi, William Blake, Jacob Needleman, Maurice Nicoll, P.D. Ouspensky, Patrick Geddes and Lewis Mumford (among so many others). Outside of his formal academic work Luke pursues creative writing on a number of topics from socio-political theory and contemporary politics through spirituality and fantasy fiction and volunteers in the in the unceeded xʷməθkʷəy̓əm gardens' (also known as the Indigenous Health Research and Education Gardens). Born and raised in San Francisco, Giuliano is a consultant at ReD Associates. He previously spent three years at Propellerfish where he tackled innovation challenges at some of the world's most admired companies in markets around the world. Prior to Propellerfish he worked in the strategy department at Bartle Bogle Hegarty, at the Innovative Technologies Department within the Italian Government and as part of a machine learning research team at University of California Berkeley. He holds a Masters of Arts from Johns Hopkins School of Advanced International Studies with a concentration in International Economics and Global History and a Bachelors of Art in International Relations from San Francisco State University. In his free time Giuliano is an avid motorbike aficionado. Lucie Irene Ashley holds a Masters of International Forestry from the University of British Columbia International Forestry Program where she concentrated on sustainable development strategies and conservation. Lucie received a Bachelor of Arts in International Relations and Religious Studies from San Francisco State University and an Associate of Arts in Journalism from De Anza College. 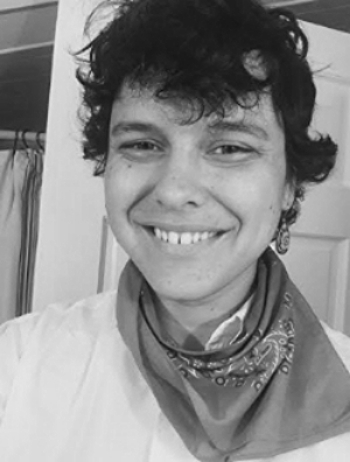 Prior to UBC, Lucie lived at the Sivananda Ashram in upstate New York, serving as the sustainability project coordinator, managing and fundraising for various renewable energy projects. While at the Ashram, she also served as one of the permaculture designers (Certified 2014), implementing permaculture principles to grow food and build structures with the goal of creating self-sustaining ecosystems. Lucie currently serves as Secretary of the Board of Directors for CCIS. In her free time Lucie enjoys the study of contemplative philosophy and religion as well as the study of German language, literature and culture. Nicole Rallis is a writer, documentary filmmaker and community activist. She was previously enrolled as a PhD student in the York University Department of Geography, concentrating on urban cultural geographies. She has completed an interdisciplinary Master of Arts in Globalization Studies from the Institute on Globalization and the Human Condition at McMaster University. Her Masters thesis employed documentary film methods to explore post-industrial transition in Hamilton, Ontario, creating, ‘This is Hamilton…After the Steel Rush’. Nicole has extensive grant writing and fundraising experience in both the academic and arts worlds, working on projects including Dusk Dances Haliburton, the Haliburton Sculpture Forest and the Canadian Association of Geographers Annual Conference—Ontario Division. She has also sat on arts and culture councils for the municipalities of Dysart et al and Highlands East. Tim Leisman is a young professional from Greensboro, North Carolina, who is passionate about advancing human development in harmony with with the emerging reality around us. He works as a program coordinator at the Center for Creative Leadership, serves on the Program Advisory Committee for the American Friends Service Committee of the Carolinas, and as Secretary on the Board of local nonprofit Emerging Ecology. He earned his Bachelor of Arts from Guilford College in 2013 in Peace & Conflict Studies and Political Science. A.T. Kingsmith is a Ph.D candidate in the Department of Politics at York University, Toronto, where his research examines the impact of different forms, feelings, and affects of anxiety on emotional health, democratic processes and social movements in urban space. He is co-founder of The Affective Cartographies Project, a Toronto, London, and Berlin-based initiative constructing open, interactive databases that map the affective terrain of world cities, both in near real time and historically to provide textured renderings of affects as they emerge through the human body in relation to the spaces and events around it. Recently, he co-edited a volume on contemporary organizing strategies entitled "The Radical Left and Social Transformation: Augmentation and Reorganization" (Routledge 2019) and co-authored a book on the politics of Eurasian infrastructural integration: "One Road, Many Dreams: China's Bold Plan to Remake the Global Economy (Bloomsbury 2019). As the chair of the digital issues committee at Canadian Journalists for Free Expression and a cofounder of the c4 Computing Club, he works with journalists, community activists, union organizers, and academics on digital defence tactics and strategies. J.M. Hamade is a practicing interdisciplinary artist and Chief Art Officer for the Center for Critical Interdisciplinary Studies and Visiting Scholar working on the fine arts dimensions of visualization development at the UBC Urban Studies Lab. He holds a Bachelor of Arts in Art with emphases on studio art and print making. J.M. has self published various works combining traditional print mediums with explorations of psychology, semiotics, and politics, including Atavistic Responsibility: A Book of Automatic Drawings and Nun: A Study in Semitic Letters and Radical Islam. More recently his work has sought to integrate theories on the production and nature of space within art practice. Additionally J.M. curated shows within the Universities’ Artery and Martin Wong galleries. Alex Hugues Scott is Language Team Lead - Product Safety Operations at Twitter - Cognizant. He holds a Masters of Arts in International Communications from American University, a Masters of Arts in Information Technology Development from Ritsumeikan University and a Bachelor of Arts in International Relations from San Francisco State University. Alex's experience in Asia, Africa, Europe and North America taught him to understand the varying dynamics of dealing with international clientele and employees. The research he has conducted on Information and Communication Technologies (ICTs) gave Alex the opportunity to work with prominent researchers in academia as well as in business. He has lead workshops and classes on the future impact of ICT on development and policy and lectured on multiculturalism, globalization and social media. Elvin Wyly is Professor of Geography and Chair of the Urban Studies Coordinating Committee at the University of British Columbia. He is a specialist on urban social and spatial inequality in U.S. and Canadian cities. His work has been supported by grants and contracts from the U.S. Department of Housing and Urban Development, the Fannie Mae Foundation, the Ford Foundation, the Social Sciences and Humanities Research Council of Canada, and the American Civil Liberties Union Foundation. He has served as Editor and Editor-in-Chief of the journal Urban Geography (2005-2015). Recent publications include “Emplacement and the Dispossessions of Cosmopolitan Capital” (Geoforum), “Gentrification on the Planetary Urban Frontier: The Evolution of Turner’s Noösphere” (Urban Studies), “Make America Housing Great Again” (Housing Policy Debate), and “Planetary Kantsaywhere: Cognitive Capitalist Universities and Accumulation by Cognitive Dispossession” (City). Greg is a well-recognized veteran with 30 years of experience in the energy sector. Best known for his extensive connections and in-depth understanding of the solar energy industry, he also brings expertise on utility smart grid solutions, utility-integrated distributed generation, power purchase agreements, demand side management, energy storage, power quality, and energy efficiency. Prior to founding Energy Productivity Inc., Greg served as vice president and chief operating officer of Solar Frontier, where he oversaw operations in the Americas and was responsible for commercializing a breakthrough thin-film solar module. He was also president of the U.S. market for Canadian Solar, where he built a national sales team and launched the marketing and financing programs for the region. Greg also helped launch SunEdison and later served as senior manager of strategic business development. Greg is co-founder and COO of HelioGo Solar, developers of next-generation solar racking solutions poised to achieve grid parity in residential, commercial, and utility-scale solar. Leonardo O’Grady is the NWEN Director Integrated Marketing Communications at The Coca-Cola Company in Europe. After completing his BA at McGill University in Canada and MA at Johns Hopkins University Leonardo went to Italy where he specialized in Entertainment marketing working with a broad range of companies including EMI, Virgin, Warner Bros. Paramount Pictures, Universal and Sony. In Singapore he launched Beyond DDB also co-founding Rapp Collins and serving as partner in the brand-consulting arm of DDB The SpringBoard Group. He has worked in a number of financial institutions including Wachovia Bank and OUB-First-e (internet bank) as well as leading brand Coke with the local Singapore team. In 2001 he joined Saatchi & Saatchi as Business Director. His brand management experience in Singapore and Asia includes: CAAS, United Overseas Bank , Dow Jones, HBO, VW, Coffee Bean & Tea Leaf, Tower Records, HP, Lexus, Toyota, Sony, Guinness, Nestle and Ricola to name a few. Leonardo joined Coca-Cola Asia Pacific Group Office in 2006 taking on several different roles over the years leading IMC for the Region, Global Brand management for Sprite, working in the Asia Pacific Regional Sparkling leadership Team and Director of ASEAN Integrated Marketing & Communications. Dr. Athanasoulis is the Chief Technology Officer for the Healthy Communities Institute. He oversees all technical operations and product development for HCI. Prior to the Healthy Communities Institute, Dr. Athanasoulis served as the Director of Research Information Technology and Client Services for Harvard Medical School, where he led the development of high performance computing infrastructure to support biomedical and healthcare research. Dr. Athanasoulis has worked in both the public and private sector to improve quality and efficiency of healthcare and the environment through information systems. An acclaimed expert in health information technology, with over 25 years of experience, he holds a MPH in Epidemiology and Biostatistics and a DrPH in Health Informatics from the University of California at Berkeley.